Asthma attacks can be mild or severe. An asthmatic cat will squat with its shoulders hunched up and neck extended, while coughing, gagging up foamy, mucus like material, and then swallowing hard. This often appears as if the cat is trying to cough up a hairball, but nothing comes up. The cat may also breathe rapidly with its mouth open. Other symptoms include labored breathing, increased respiratory rate, lethargy, gagging, wheezing, blue lips & gums, and coughing. Symptoms may come and go. Some cats only exhibit mild symptoms such as quiet wheezing and soft coughing, and can go unnoticed by owners. 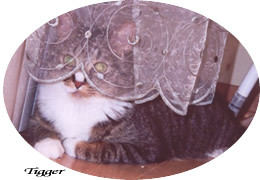 Many affected cats are free of symptoms between periods of breathing trouble. Although these are the classic symptoms, your cat may experience them all or just a few. As an example, not all cats with respiratory disease cough but instead have audible throat gurgling, more audible when purring, swallow a lot and often lose their voice. Also, many owners notice that their cats get eye mucus during bouts of chronic inflammation and in fact, this can be a good indicator in some cases that an increase of anti inflammatory drugs may be needed. You will learn how the disease presents itself to your cat as you go along. The disease is a difficult one and only learned with close monitoring of the cat and no two cats are the same. The Feline Asthma List comes into action here, as an excellent place to compare notes with other owners who have had similar experiences. Coughing: If it's more than 5 minutes, or more than twice an hour/3 times a day, increase medications and/or see the vet. Breathing: Breaths should be 20-30 per minute. Anything greater than 30/minute indicates probable inflammation. Breaths more than 40/minute needs immediate treatment. Breaths more than 60/minute indicates the animal is in serious respiratory distress. Pulse Rate: The resting heart rate is 110-140 with an average of 120. You can feel your cat's pulse by the jugular, in the wrists and in the groin at the uppermost part of the inner thigh where the leg meets the body. It's good to practice finding the pulse, so you know where to look in an emergency.